The sun was blazing and it was set to be the hottest day of the year; it was the Wimbledon final and Andy Murray was playing for the title; and our ears were still ringing from our performance with the Rolling Stones in Hyde Park the night before. But we had work to do. So, armed with pencils, water (and, most importantly, Haribo) we set to work! Come concert time, we were very impressed by the size of our audience, given that it was the hottest day of the year so far and the Wimbledon final! Voce's MD Suzi Digby and one of her colleagues from USC, Nick Strimple, had curated a programme of music to take us and our audience on a journey through American choral music. Guest conductor Tim Sutton conducted us in Bernstein’s Alleluia and then we were off. The first half consisted of pieces by the great American composers; Bernstein, Copland, Carter and Ives. The most enjoyable piece for me was the Ives, Psalm 90: the accompanying tubular bells and other percussion (played by Andy Martin) and organ (Duncan Aspden) resulted in a very haunting and moving performance. We also included a trio of contemporary American composers: Laurisden, Whitacre and Strimple. After the interval, we split into small groups to perform some familiar American songs as well as some little-known examples of eighteenth and nineteenth century American choral music. All in all, the concert was a great celebration of American composers. We all learnt a bit more about the breadth of the American choral tradition and in true Voce style celebrated with a drink afterwards in the local pub. After another concert with the Rolling Stones in Hyde Park and Evensong at St Gabriel’s Pimlico, we will be taking our summer holidays. We return in the Autumn with an exciting new concert schedule: keep an eye on the website for dates to be announced! 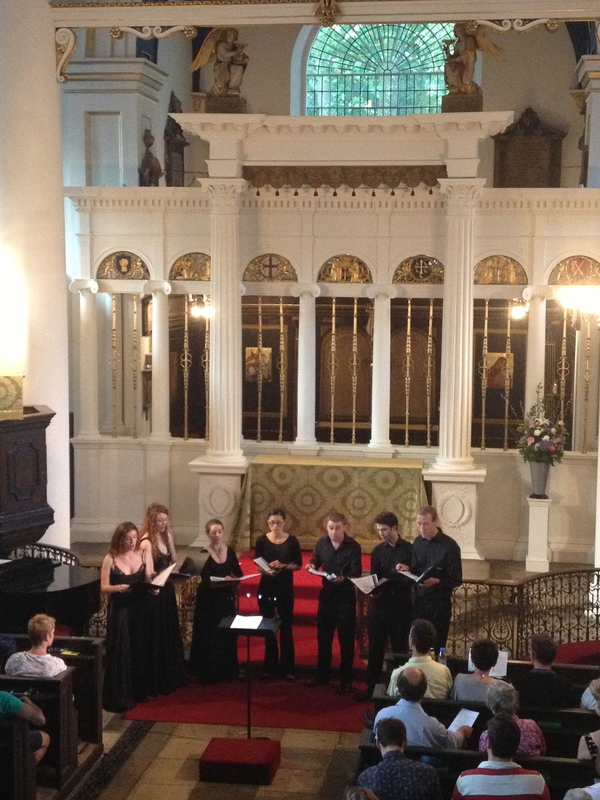 Voce gave a concert of Choral Americana at the Grosvenor Chapel in Mayfair on Sunday 7 July. The choir will perform with the Rolling Stones in Hyde Park on Saturday 13 July and sing Choral Evensong at St Gabriel's Church, Pimlico, on Sunday 14 July (entrance free, all welcome). Guest blogger Rebecca Mair is Voce's Auditions Manager, and the choir's best and most careful driver.